Ben Nevis is the highest peak in Scotland, located at the western end of the Grampian Mountains in the Lochaber area of Scotland, close to the town of Fort William. It's not just the highest peak in Scotland, it's also the highest peak in Britain and the highest peak in the U.K. Three in one! Its summit is at 1344 meters and you start the ascent at or very near sea level. It's a full day's trek to the summit and back, or at least it is for me. From Achintee House, outside Fort William and at just 45 meters elevation, I took just over 4 hours to get to the summit and then 2.5 hours to get back down again. As Ed Viesturs has said, "Getting to the summit is optional. Getting back down is mandatory." 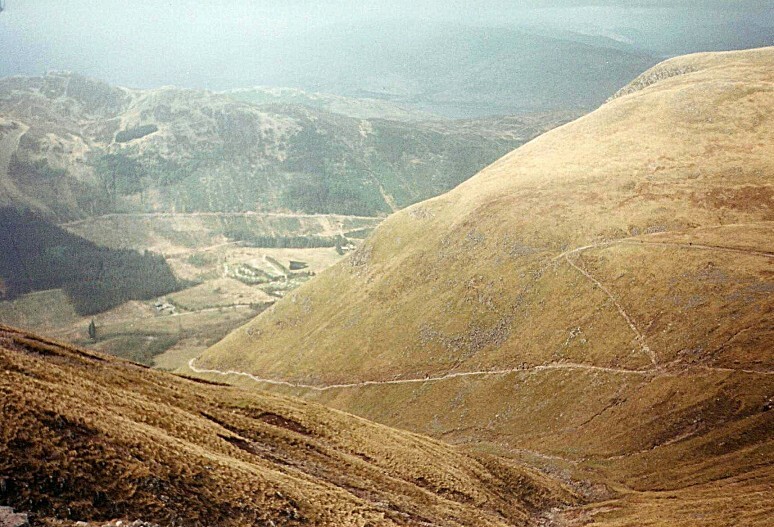 Beware — when the Scots talk about "hill-walking", they refer to an activity that might be rather more vigorous than you expect. This isn't an easy stroll. Many people would call it mountain trekking. But it is a walk and not a climb. 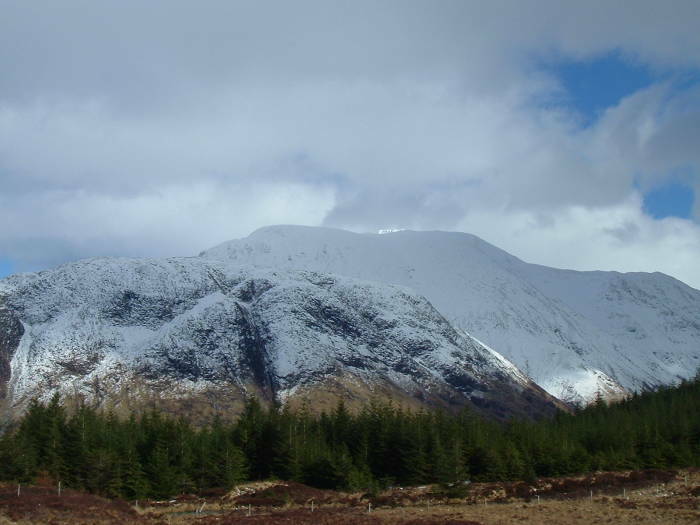 Ben Nevis is the anglicized form of the Scots Gaelic name Beinn Nibheis. Ben Nevis is joined to Carn Mòr Dearg by the Carn Mòr Dearg Arête. 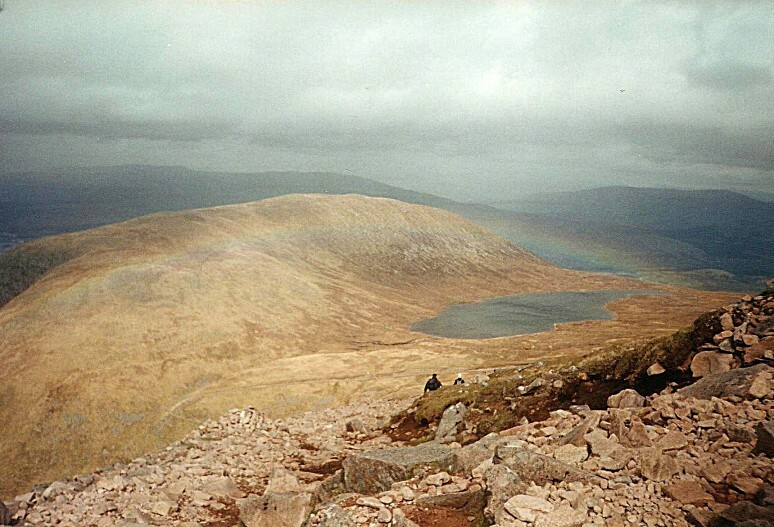 Both Ben Nevis and Carn Mòr Dearg are among the eight summits in Britain over 4000 feet (1219m). 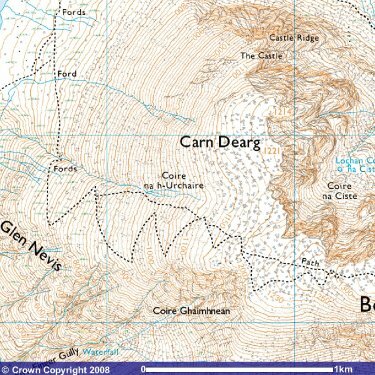 There are two subsidiary "tops" on Ben Nevis, both of them very confusingly named Carn Dearg (Red Hill). The higher at 1221 meters is north-west of the summit, and obscures the actual summit from many locations. The lower peak at 1020 is to the south-west of the summit. 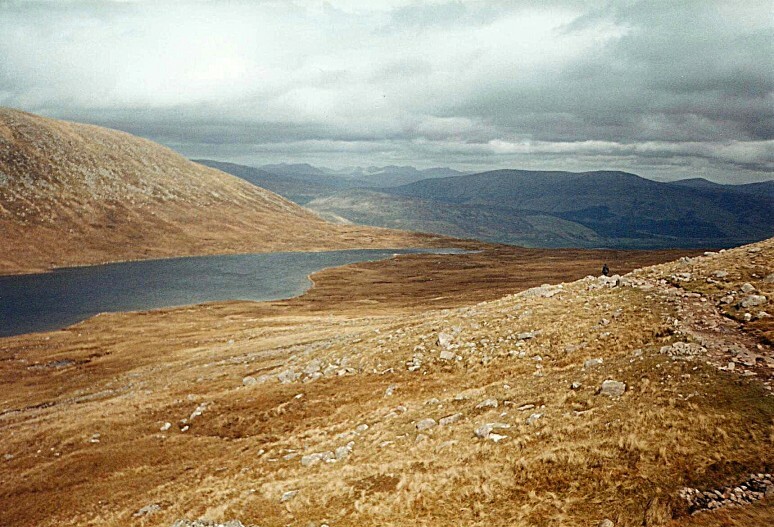 Meall an t-Suidhe, at 711 meters, lies to the north of Ben Nevis and is joined to it by a saddle containing Lochan Meall an t-Suidhe. These clustered peaks are the collapsed dome of an ancient volcano from Scotland's volcanic remote past, shaped by glaciation. The volcano was formed in the Devonian era, and came to a violent end in the Carboniferous period around 350 million years ago. Near the summit you find light color granite which had formed several kilometers below the surface side-by-side with the dark basaltic lava that only forms on the surface. This shows that the volcano collapsed in an explosion like that of Thera in the 2nd millennium BC or Krakatoa in 1883. The remaining peaks were then heavily reshaped by glaciation. 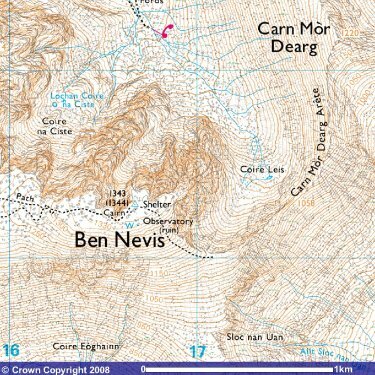 Location of Ben Nevis, in Scotland. 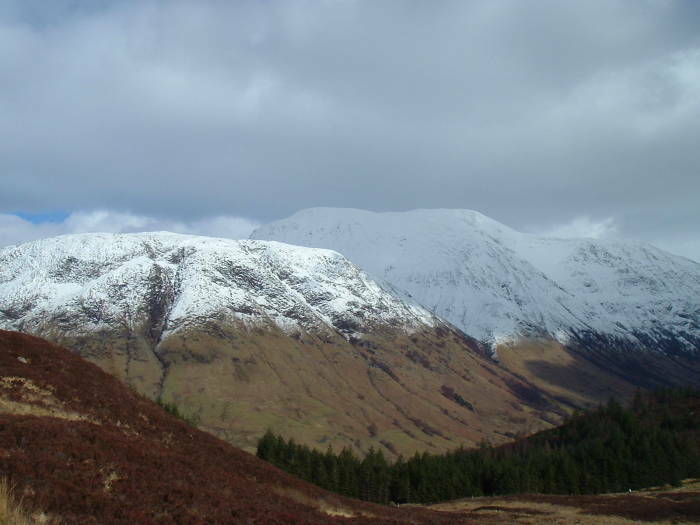 The first recorded ascent of Ben Nevis was in 1771. It was only in 1847 that the Ordnance Survey confirmed that Ben Nevis was the highest mountain in Britain and Ireland. Now some 100,000 people make the ascent each year. 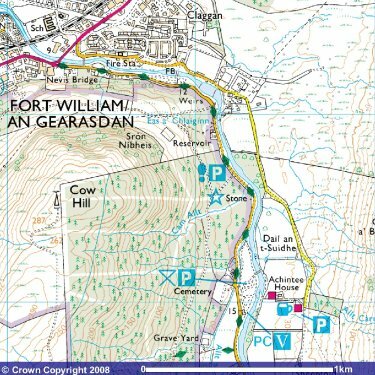 The UK uses a unique National Grid Reference System, and you need to understand how it works to benefit from the Ordnance Survey maps. See my page for an explanation if needed. The first picture here shows Ben Nevis at the right, in shadow. To its left is Meall an t-Suidhe, in sunlight. This picture was taken in early April. The snow line was at about 300 meters, so the upper kilometer of elevation was in snow then. The snow was about a meter deep at the summit. Enough people do the walk that there's a distinct path tramped down, but there would still be plenty of wading through snow. 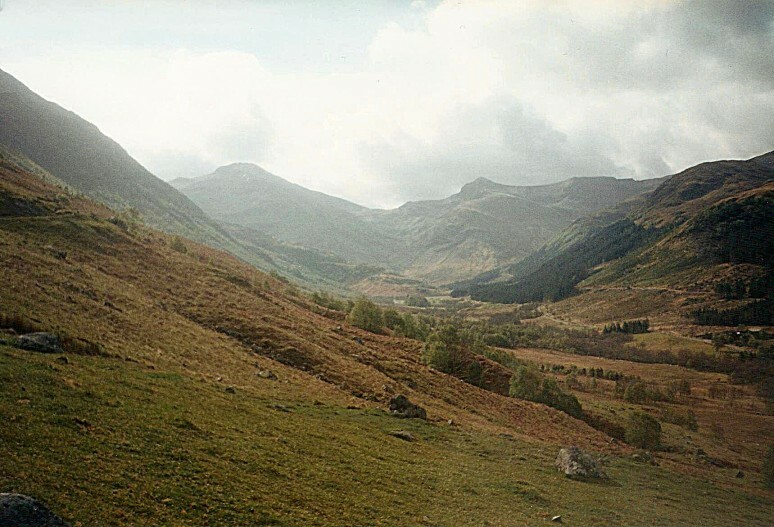 The western and southern flanks of Ben Nevis, seen here, rise 1,200 meters from Glen Coe in about two kilometers, making for the longest and steepest hill slope in Britain. The north face, behind Meall an t-Suidhe here, has 600-meter cliffs dropping to Coire Leis. The entire south side of the mountain and the summit platform was all purchased by the John Muir Trust, a Scottish conservation charity. Meall an t-Suidhe, in sunlight at left, and Ben Nevis beyond it. The snow line is around 300 meters. Sunlight on the summit of Ben Nevis. The second picture above is a relatively uncommon view of Ben Nevis out of the clouds. The broad summit platform is actually in sunlight here, it's the brightly lit area visible over the broad humps. Carn Dearg, to its left, is a lower summit of Ben Nevis and appears to be higher because of perspective in this picture. As the Scots would jokingly ask, "What are those bright blue areas in the sky? Some unusual type of cloud?" The weather tends to be challenging. Ben Nevis is up in the northwestern Highlands, along the northwest coast of Scotland. This is where the weather coming off the north Atlantic first hits land. Daily weather measurements were taken at the summit observatory from 1883-1904, recording fog present on the summit almost 80% of the time between November and January, and 55% of the time in May and June. The summit experiences 261 gales in an average year, and receives 4,350 millimeters of rainfall versus 2,050 mm in Fort William and just 580 mm in "rainy London". It will rain until you reach the elevation where the rain turns first to sleet and then to snow. A lot of wind gets funneled through the glens and then blows very strongly as it is forced over the mountains. This gives you the experience of being sprayed with rain and sleet from below. So, you should take multiple layers of clothing, including a waterproof outer layer. Wear sturdy boots as almost all of the ascent itself is along a rocky path. You walk on irregularly shaped rocks 20-30 cm in diameter. The climb is hard on ankles and knees. Take water and food, and adequate navigational gear. GPS is wonderful for displaying your precise coordinates, but you need a good map and you need to know how to use it if those coordinates are to be of any use. See my description of the National Grid system for what that's about. A plain old compass is crucial, the top is fairly flat and featureless and you will probably be in clouds, so you need to make very certain that you don't fall off the cliffs along the northeast face. Start early to allow yourself plenty of time to get back down off the mountain. I'm not in great shape and I took my time. I made plenty of stops just to look at the fantastic views (at least until I entered the cloud base). 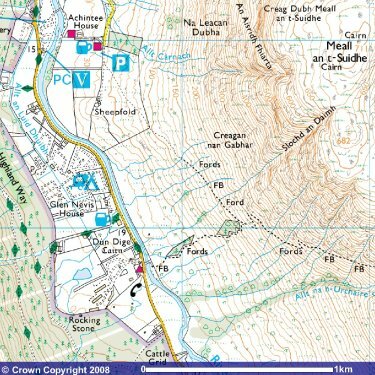 The standard time reference point seems to be Achintee House, where the summit path starts angling up along the west flank of Meall an t-Suidhe. That's at NN 12582 72337, just 45m elevation. I took 4 hours to get from there to the summit, and then 2.5 hours to get back down again. Add in time to get to and from Achintee House from wherever you're staying. The Glen Nevis area (1:250,000). Here is an overview — from Fort William at sea level along Loch Linnhe, east and south into Glen Nevis, up along the flank of Meall an t-Suidhe, turning northeast up Allt na h-Urchaire (Red Burn) onto a saddle overlooking Loch Meall an t-Suidhe, then up a series of switchbacks to the summit at 1344 meters. Ben Nevis looks like a big dome from Glen Nevis to its west and south, but there are very steep slopes and cliffs on its northeast face. The approach to the summit passes close to those. You definitely want the 1:25,000 Ordnance Survey map. Book stores and other shops in Fort William sell them. Big book stores in Edinburgh have OS maps for all of Scotland, and even some in London sell OS maps for all of Britain. 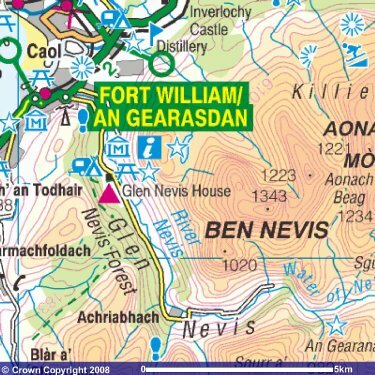 I used the Explorer 392 map, titled "Ben Nevis & Fort William; The Mamores & The Grey Corries; Kinlochleven & Spean Bridge." I took the map but also carried a small sketch I had made showing the elevations and, more critically, the grid coordinates of the various path intersections and turns. I also had notes about various time estimates for remaining ascent and ascent and return from various points. This let me keep track of where I was on the switchbacks making up the final third of the path. You will probably be in the clouds at that point. It was handy to have a quick reference without trying to read a large map in the wind. You walk out of Fort William to the east, crossing the Nevis Bridge and immediately turning right to follow the path along the northeast bank of the River Nevis. The path leaves the river and the road and passes through some sheep farms. Alternatively, you could follow the Glen Nevis road and cross the river on one of the footbridges before you pass Achintee House. Fort William and northern Glen Nevis (1:25,000). Achintee House to Allt na h-Urchaire (Red Burn). Achintee House is reachable by footpath and footbridge from the main road into Glen Nevis, but the footpath you follow is east of the river, sharing the small access lane. Achintee House is at NN 12582 72337, 45m elevation. South of Achintee House the path angles to the southeast and slowly ascends along the west flank of Meall an t-Suidhe. 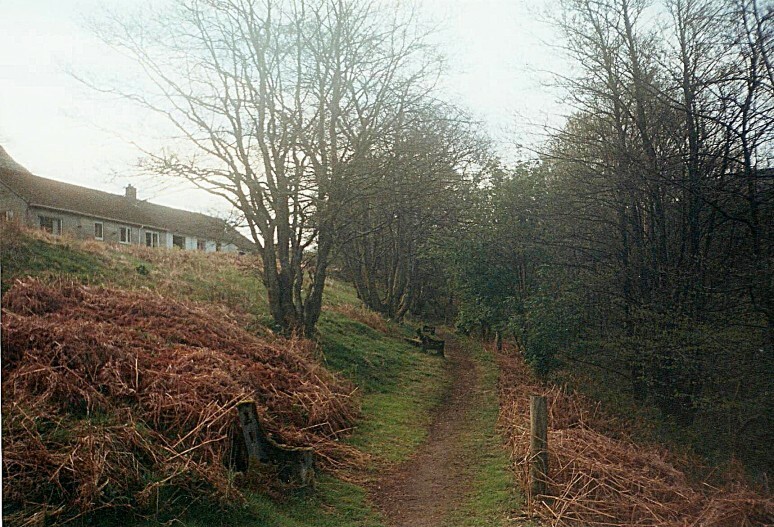 The path is joined by a staircase-like path leading up from the hostel along the road (shown as a red triangle). That intersection is at NN 13313 72031, 185m. Leaving Fort William, just beyond Nevis Bridge. Starting up the flank of Meall an t-Suidhe. The path climbs steadily with a few small switchbacks as it goes counter-clockwise around the south end of Meall an t-Suidhe. 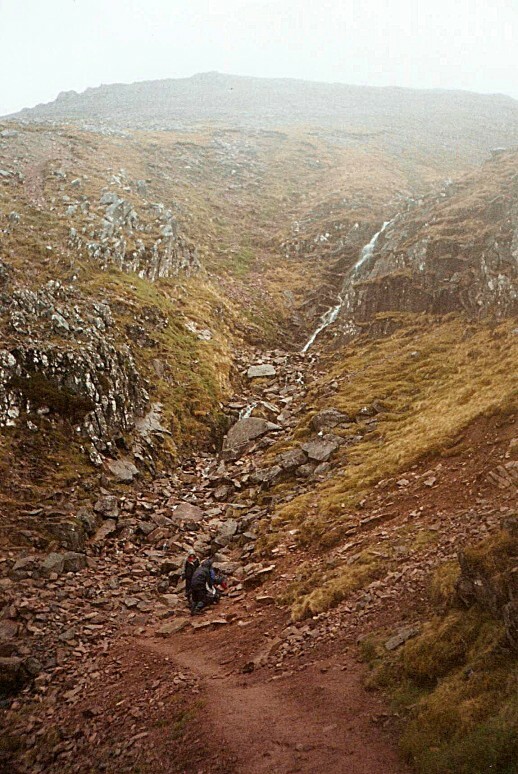 Allt na h-Urchaire, or Red Burn, is a stream coming down the steep-sided valley out of the saddle between Meall an t-Suidhe and the southern Carn Dearg. The path climbs that valley with a large switchback leading to the saddle. Above is the view looking south through Glen Nevis from just above Achintee House. Great views, sunny and warm. That will eventually change. 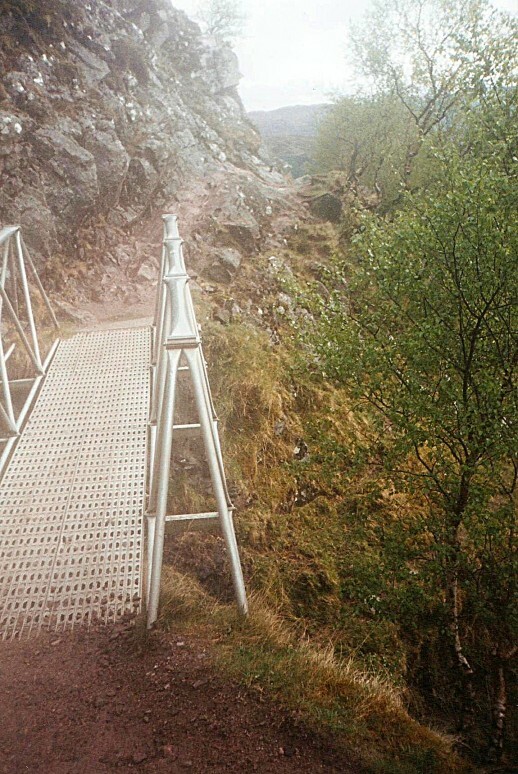 There are three metal footbridges along the lowest section of the path where it crosses burns or streams coming down off Meall an t-Suidhe. They're along the main path just above the intersection with the steep hostel path. The rain has started! Expect varying and inclement weather. You can see here what I meant about the trail being on irregularly shaped rocks. Crossing a footbridge in the rain. Wind-bent trees near Allt na h-Urchaire (Red Burn). In the pictures above we're coming around the south end of Meall an t-Suidhe, approaching Allt na h-Urchaire, or Red Burn. The shape of the trees indicates the frequent wind. The wind is funneled through Lochan Meall an t-Suidhe between Carn Dearg and Ben Nevis to the south and Meall an t-Suidhe to the north. And then the weather will suddenly change. Rainbows need rain, of course. This is looking back down into Glen Nevis from the path along Allt na h-Urchaire. I got to here about an hour after passing Achintee House. The elevation is 435m. 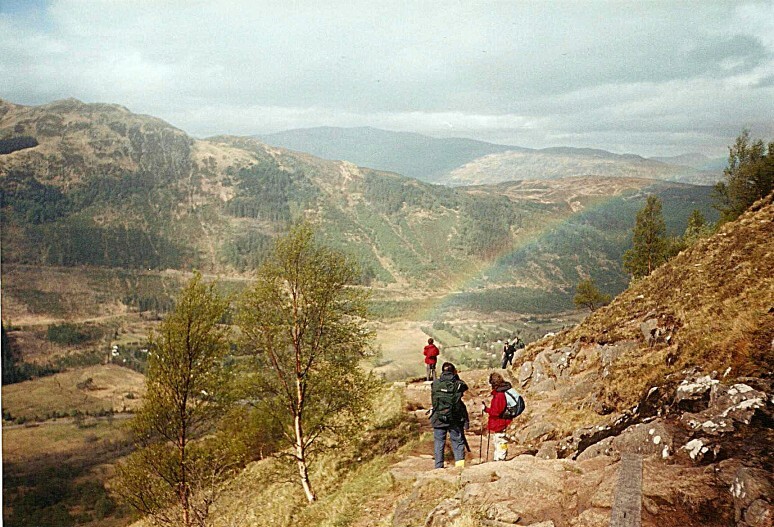 A rainbow over Glen Nevis, looking back from Allt na h-Urchaire (Red Burn) on Meall an t-Suidhe. 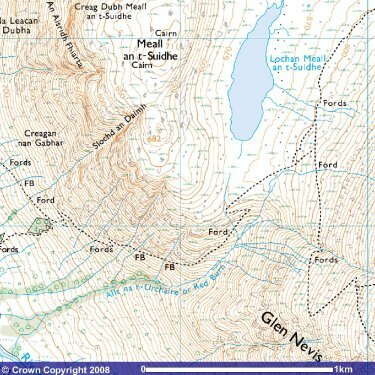 This detail shows the rest of the ascent through Allt na h-Urchaire and to the path junction near Lochan Meall an t-Suidhe. There is a large switchback with its top turnaround at 600m. Then you're up on the large open saddle between Meall an t-Suidhe and Carn Dearg, a lesser peak of Ben Nevis. Crossing this saddle for close to a kilometer is the only place above Achintee House that the trail is on turf rather than rock. It's very dramatic with views across the high loch, of the surrounding mountains, and down into the valleys on either side. The three-way trail intersection up on the saddle is around NN 1472 7240, 645m. It took me 90 minutes to cover the 3.5 kilometers of trail from Achintee House to that intersection. Allt na h-Urchaire and Lochan Meall an t-Suidhe. The Ben Nevis summit trail branches to the south and climbs, and from there it's another 5 kilometers and 699 meters of elevation gain to the summit. At this point you are just about half-way to the summit in elevation. Various trekking guides estimate the time required from here as 2 to 3 hours to ascend, and 3 to 5 hours to ascend and return to this point. My times were right in the middle of those estimates, even including frequent breaks to take in the view and a lengthy stop to eat my lunch on the way up. As another time estimate, it took me four hours from the top of the hostel trail to the summit, and then 2.5 hours back down to there. The path crosses over two streams coming down off Ben Nevis and then starts going up switchbacks. The switchback turnarounds are at: 780m, 830m, 990, 1000m, 1050m, 1120m, 1150m, 1190m, and 1200m. The rain turned to sleet about 100m above the cloud base, and then turned to wet snow above that. 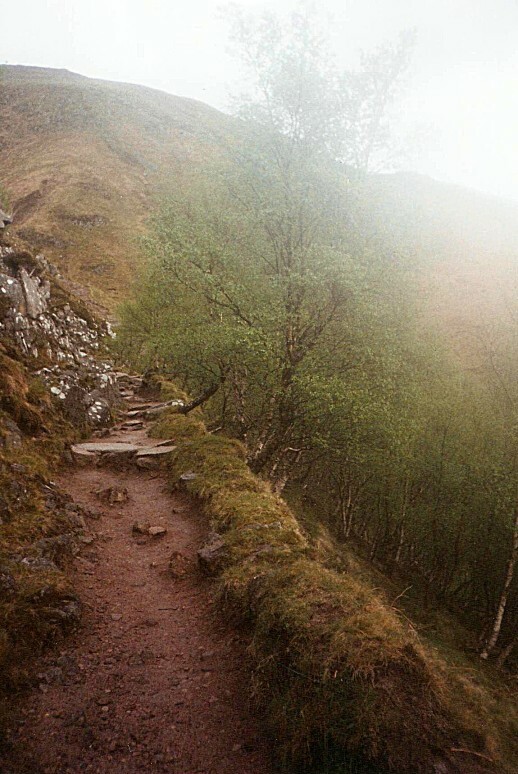 The path up the Ben Nevis switchbacks. Coire na h-Urchaire comes down off Carn Dearg. The top half of the climb is the tougher by far. It's a constant climb with no view once you're in the clouds, and the worst of the switchbacks are the ones where you walk into the wind. Here the path has left the Lochan Meall an t-Suidhe junction and crosses Coire na h-Urchaire, a stream coming down off Carn Dearg. The rain is back, and Carn Dearg disappears into the cloud base. And then it clears up and the sun comes out for a while! View of Loch Meall an t-Suidhe from the lower switchbacks. Here is the view back down to Loch Meall an t-Suidhe, a lake about 600m long on the saddle between Meall an t-Suidhe and Carn Dearg. This section of the climb had the best views, being about as high as you got before going into the clouds. If you had continued straight at the three-way intersection, the path leads to a mountain rescue hut under the north cliff faces of Ben Nevis. Then it follows the stream Allt a'Mhuilinn north and back toward the road east of Fort William. From a little higher you may have a nice view down through Allt na h-Urchaire to the lower part of the path, and beyond into Glen Nevis. View down through Allt na h-Urchaire to Glen Nevis. View of Meall an t-Suidhe and Loch Meall an t-Suidhe from higher on the switchbacks. Here's a view from even higher, down onto Meall an t-Suidhe and Loch Meall an t-Suidhe. And, from a switchback turnaround point, a great view down into Glen Nevis. The River Nevis and the road into the glen are visible immediately below. Fort William is mostly hidden under Cow Hill, the clear-cut area just above the slope of Meall an t-Suidhe and just below Loch Linnhe. Loch Linnhe runs horizontally to the left, barely visible here, toward the sea. Loch Eil is more visible beyond Loch Linnhe. View from the Ben Nevis switchbacks of Glen Nevis, Loch Linnhe, and Loch Eil, with Fort William barely visible. Climbers disappear into the cloud base on the upper switchbacks. Staying on the path requires some attention, as the upper slopes are pretty bleak and covered with nothing but the red rocks of various jagged sizes. At 1200m the trail splits at the ruins of an old weather observation station. A very dedicated researcher in the late 1800s used to climb up daily to take measurements! The last 500m along the path is mostly flat, skirting the edges of the cliffs. The cliff face runs west to east, the path follows that. At that point you may be in well-trod snow, making a distinct path. If the snow is fresh, be very careful! The wind blows the snow into large cornices overhanging the cliff face. If you walk toward the edge, you could drop through a cornice and fall out the bottom before you realized you were near the edge. 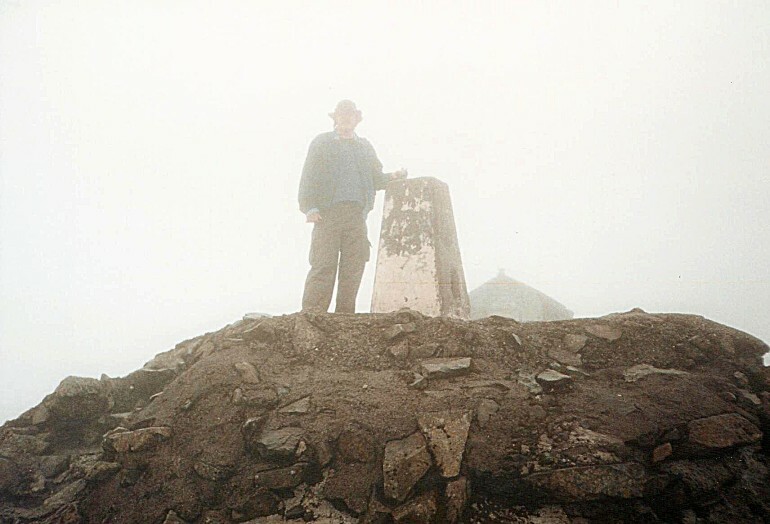 There are dire warnings in Lonely Planet's Walking in Britain — "In poor visibility, don't lose sight of the summit cairn until you're ready to descend. [....] To descend you must retrace your steps. If the cloud is down then, from the trig point, walk for 150 meters on a grid bearing of 231 degrees, then follow a grid bearing of 281 degrees. This should take you safely off the plateau and on to the path. Remember to allow for magnetic variation. If you don't know what that means, you shouldn't be up here." The Ben Nevis summit platform. As you near the summit you pass the ruins of a maniacal hotel someone built on the summit. They didn't get much business. Also a stone war monument, which required the hauling of carved stone marker panels and mortar. And finally, the survey point at the summit! NN 1668 7128, 1344m elevation. Most people making it to that point were wet, cold, and tired, so you get someone to snap a murky picture and you head back down. At the Ben Nevis summit! The view from here on the rare clear day is said to be fantastic. Ideally, you can see out beyond 190 kilometers, to Lochnagar, Ben Lomond, Barra Head, and even Knocklayd in County Antrim, Northern Ireland. Still on my to-do list: take the path to the saddle, then continue north and then west instead of turning onto the summit path. The path would lead under the north cliff faces of Ben Nevis and cross the stream Allt a'Mhuilinn. Then ascend Carn Dearg Meadhonach, and follow the ridgeline from there to Carn Mòr Dearg, and from there along the Carn Mòr Dearg Arête to summit Ben Nevis from the other side. It would take the right weather to do that, and for it to be worthwhile. I've been told that September and maybe early October would be the right time — the snow would be at a minimum and the weather would be as good as it gets. West Coast Mountain Guides have information on Ben Nevis and other peaks. Some travel guides like Lonely Planet's Walking in Britain make a big deal about there being more deaths annually on Ben Nevis than on Mount Everest, at least in some years. Handy tables of deaths on Ben Nevis don't seem to be out there, but here is one for Everest. 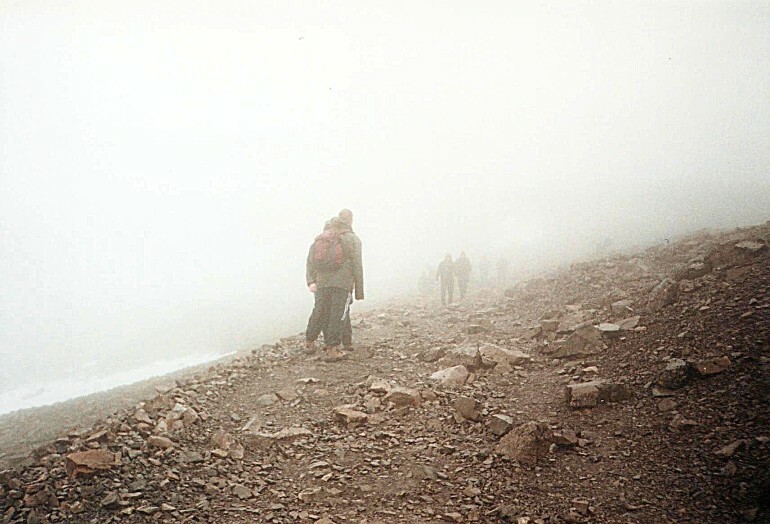 Anecdotally, there were 41 rescues and four fatalities on Ben Nevis in 1999, and 13 fatalities between 1990 and 1995 (eight of those due to falls while rock climbing). It is made more dangerous by the broad summit area being roughly kidney-shaped and surrounded by cliffs on three sides. Careful navigation is required to get down from the summit. There is plenty of accommodation in Fort William. 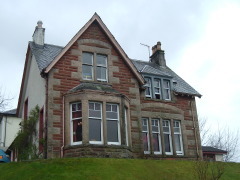 I stayed at the Fort William Backpackers hostel, in the eastern part of Fort William. Fort William also has plenty of places to get food. Pubs, a variety of restaurants, and the supermarket near the train station is a good place to pick up supplies for day treks. You can get there on the West Highland Railway out of Glasgow, with a few trains each direction every day. Bus service is more frequent. Fort William Backpackers can tell you about a minibus route running around Scotland and also stopping at hostels in Edinburgh, Pitlochry, Inverness, Skye, and Oban. You can buy a hop-on, hop-off ticket that takes you around the whole circuit. 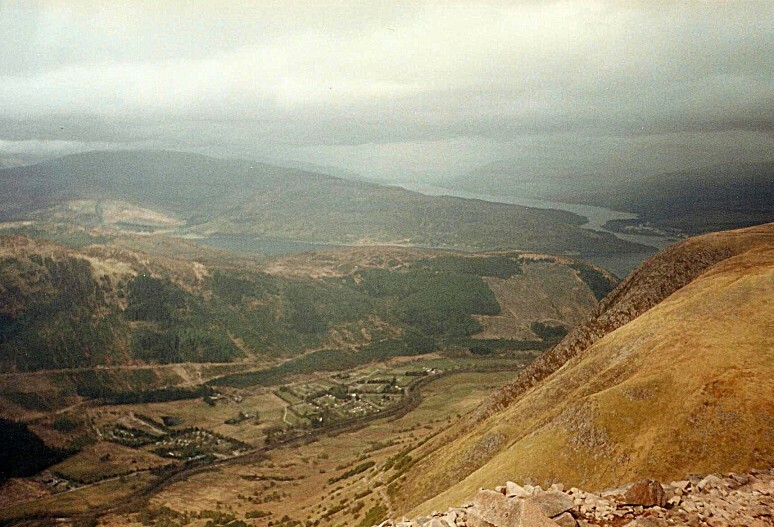 There's a Ben Nevis webcam so you can see how cloudy it is from the comfort of your home. The webcam is run by the Fort William tourist bureau.